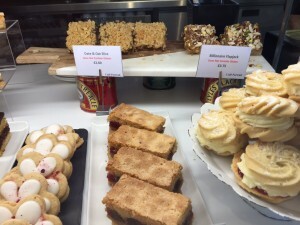 I have often praised the gallery cafes in Edinburgh: Cafe Portrait and the two at the Modern art galleries. This morning after an art fix, we dropped by for a cake and coffee fix. The food at Cafe Portrait is exceptional and there are always good gluten free options. See my review for Cafe Modern One to appreciate the quality of the food and understanding of the staff. There were three gluten free cakes on offer: date slice; Eton Mess Slice; and Billionaire Flapjack (ooh that sounded good!). 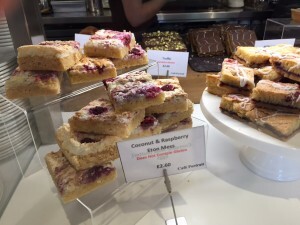 We chose to test out the Eton Mess Slice, which was actually raspberry rather than strawberry. Crunchy biscuit was topped with raspberries and meringue – just a really good quality cake that does not scream ‘Hey, I am gluten free!’ at you, which is how it should be. Some delicious coffee and a pot of peppermint tea and we were happy. There are some terrific exhibitions on at the Portrait Gallery during the festival period: Lee Miller and Picasso; and photography of the Great War. There is also a great permanent sculpture exhibition on the ground floor which should not be missed. A nice little outing with a visiting friend!